This is the ORIGINAL 2003 SEGA Version of TYRANNOSAURUS REX. This Glorious Figure measures 18 ½ inches long and stands 9 inches tall. 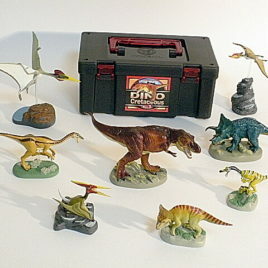 Dinosaur Figures sculpted by Hirokazu Tokogawa. They are painted by Juzo Tokoro with careful detail. This vicious vinyl T-Rex comes with his own large vinyl stand! Sega also issued a re-paint in 2004. This is the ORIGINAL which is very HARD to FIND! You have to “pop” the tail into place by heating the vinyl with a hair dryer. It comes in its ORIGINAL PACKAGING. CLAWMARK TOYS WARNING; Not suitable for young children due to sharp parts. PLEASE scroll down for additional photos. This series of capsule figures is from the DINO Kingdom Expo 2012 at Makuhari Messe Center in Chiba, Japan. These were made by Takara Tomy A. R. T. S company of Japan. They are limited to this expo and come in "blind" capsules (meaning you put your money in the machine and do not know which dinosaur figure you will receive. It takes many tries to get a full set including the SECRET figure. We have opened them for you so you can get the dinosaur you want! This Amazing Expo is open from 7/21 to 9/23 2012. We traveled 2 1/2 hours each way to attend and paid the rather pricey admission fee. We live in Japan so we are used to high costs and poor dollar yen exchange rates. We also attended the Yokohma Dino Expo which has exhibits from the Fukui Prefectural Dinosaur Museum. This Expo features some INCREDIBLE fossils and skeletal figures of dinosaurs found in China. It has many Dinosaurs only recently named such as the Yutyrannosaurus hauli. 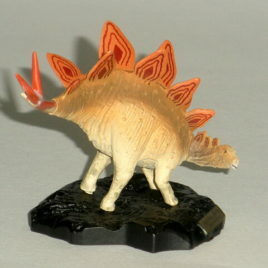 This Stegosaurus stenops figure is approximately 4 1/4 inches long and about 2 1/2 inches tall. It is made of PVC and requires some snapping together. It comes with a stand. It is beautifully painted and detailed. This Stegosaurus stenops is meant to be paired in BATTLE with a Allosaurus fragilis (please see the other figures in the series) Each one comes with its Original Paper insert which has the Dino Kingdom Logo on it. In addition we will include a Dino Kingdom promotional poster if you purchase all 7 of these figures. A WONDERFUL Addition to your Dinosaur Collection. Please scroll down for additional photos of the figures and some AWESOME PHOTOS of the EXPO. Here is the Hard to Find set of 8 dinosaurs made by the Colorata Company of Japan. This is the Practical Guide of Dinosaurs Vol. 1 Cretaceous. The set contains the following: Tyrannosaurus, Triceratops, Velociraptor, Protoceratops, Gallimimus, Quetzalcoatlus, Dsungaripterus, and Pteranodon. Each figure is beautifully painted with amzing detail. They are made of pliable PVC. The figures range in size from 3 inches to 5 inches approximtely. Each set comes in its own plastic carrying case. The set also comes with a educational fact filled bilingual guide book with information on each dino. CLAWMARK TOYS WARNING: Not suitable for very young children due to small parts. Scroll down for additional photos. 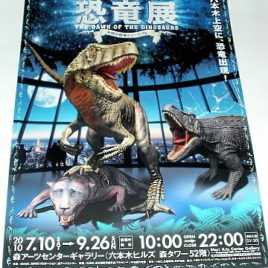 This is the MINI POSTER from the TOKYO "DAWN OF THE DINOSAURS" EXHIBIT. This exhibit features fossils found in the Ischigualasto Formation in Argentina an area rich in Late Triassic deposits. The action packed Mini Poster measures approx. 12 inches by 8 1/2 inches and features the three main dinosaurs from the exibit. It looks like the Frenguellisaurus and the Saurosuchushave crashed through the window of 52nd floor of the Mori Gallery and are fighting over who gets to eat the Exaeretodon! Life is tough when you just an early mammal. This wonderful Dinosaur Exhibit was held on the 52nd floor of the Roppongi Hills building in BEAUTIFUL DOWNTOWN TOKYO! You can see the skyline as you gaze at these amazing creatures. This would look great on the wall of any young or young at heart DINOSAUR LOVER! The back of the Mini Poster shows the featured trio as well as showing a few photos of this amazing exhibit. Who would have thought they would ever see Dinosaurs on the top of one of the TALLEST BUILDINGS IN TOKYO?? SCROLL DOWN FOR A COUPLE OF PHOTOS FROM THE EXHIBIT! From The Dawn of the Dinosaurs Exhibit at the Mori Art Center in Tokyo come this series of small dinosaur figures. The dinosaurs are from those that are featured in the exhibit. 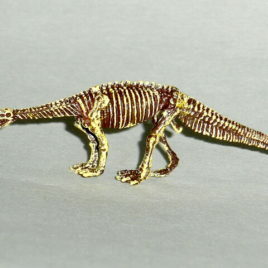 This figure is the LESSEMSAURUS Skeleton. These mini figures are ONLY AVAILABLE at the exhibit and come in a capsule from a machine. When you put your money in there is no way to know which figure you will receive. We have brought them to you and you can choose which you want! The figures are made of a hard PVC. Each figure is approximately 2 inches long. Some in the series are a little longer. Each comes with its paper insert but no capsule. Scroll down to see additional photos. Clawmark Toys Warning: Not recommended for very young children due to size of toy.